In the modern world, natural disasters are becoming more commonplace, unmanned systems are becoming the norm, and terrorism and espionage are increasingly taking place online. All of these threats have made it necessary for governments and organizations to steel themselves against these threats in innovative ways. 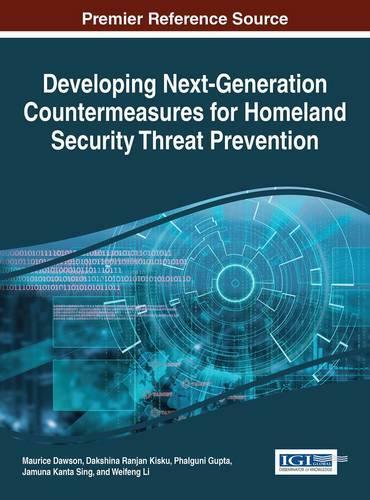 Developing Next-Generation Countermeasures for Homeland Security Threat Prevention provides relevant theoretical frameworks and empirical research outlining potential threats while exploring their appropriate countermeasures. This relevant publication takes a broad perspective, from network security, surveillance, reconnaissance, and physical security, all topics are considered with equal weight. Ideal for policy makers, IT professionals, engineers, NGO operators, and graduate students, this book provides an in-depth look into the threats facing modern society and the methods to avoid them.